Does your Shampoo or Conditioner Contain Toxic Ingredients? This ingredient which produces all that foam and lather when you shampoo your hair is the same ingredient used in car washes and garages as a degreasing agent? Visit the SLS page on the Environmental Working Group’s (a non-profit public-interest research group known for making connections between chemical exposure and adverse health conditions) website, you will see a very long list of health concerns and associated research studies. In fact, you will also see their mention of nearly 16,000 studies about the toxicity of this chemical. Medical journal Cancer’s 2007 review of mammary carcinogens. Dioxane was identified as one of 216 chemicals linked to breast cancer in rodents. Its connection to carcinogens was first reported in 1965 and confirmed in 1978. Back in 1985, the American FDA requested that manufacturers voluntarily limit dioxane levels in cosmetics and personal-care products to 10 parts per million. But it hasn’t happened. Approximately 42% of all cosmetics are contaminated with NDEA and shampoos have the highest concentrations. DEA reacts with nitrite preservatives and contaminants to create nitrosodiethanolamine (NDEA), a known, potent carcinogen. DEA seems to block absorption of the nutrient choline, which is vital to brain development. Pregnant women actually require extra choline to pass onto their baby because choline is necessary to provide proper nutrients for a healthy baby. MSG in food can cause symptoms like headaches, dizziness, and stomach discomfort after consuming MSG-containing products. And according to the FDA, MSG side effects include: numbness, burning sensations, tingling, facial pressure, headaches, nausea, drowsiness and weakness, among other problems. This active ingredient is found in engine coolants and antifreeze, de-icers, tire sealants, paints, adhesives, and in guess what? Material safety data sheets warns users to avoid skin contact with propylene glycol as it is a strong skin irritant and can also cause liver abnormalities and kidney damage! The most disturbing of these is antimicrobial preservatives called parabens which have proven to disrupt your endocrine system. They mimic, disrupt or block the actions of your hormones and interfere with your body’s hormonal pathways. When you consider that the endocrine system regulates every function of your body and tells your cells what to do, you can imagine the disastrous consequences. One messenger hormone, estrogen, is secreted by ovaries and plays a big part in regulation of fertility, pregnancy, menstruation and fat cell activity. Too much estrogen can cause big problems including weight gain, fluid retention, and depression. Parabens stop the growth of micro-organisms in cosmetic products. It is absorbed through skin into blood and the digestive system . During biopsies from breast tumors Parabens are regularly found in tissue at concentrations similar to the ones found in the cosmetic products  . Parabens are used in a wide range of products from shampoos and lotions to deodorants, creams and makeup. Tests in the USA discovered that nearly all urine samples from adults contained Parabens. . 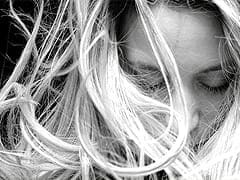 Learn how a simple natural approach to keeping hair and scalp healthy could help prevent unnecessary hair loss and create a naturally healthy environment for hair regrowth. Discover natural oil treatments that may be used for hair loss prevention and to promote healthier hair. 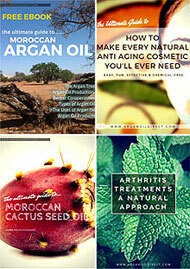 Scroll down to view more articles about using Argan Oil for your hair. 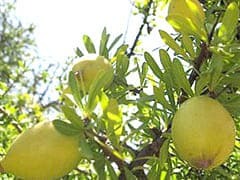 Where to Buy Pure Organic Argan Oil for Hair? 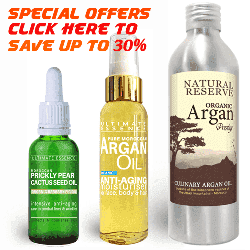 Buy genuine, certified Argan Oil products and Hair Magick total repair serum offers from our web store. You can also buy directly from this web pages below where you see the add to cart buttons. If buying pure Argan Oil for hair treatments we recommend to choose the “Pure deodorised Argan Oil”. Gray, J – State of the Evidence: The Connection between Breast Cancer and the Environment. (2008).